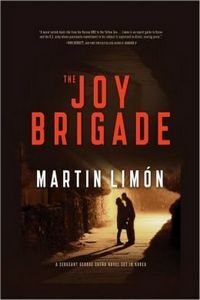 The Joy Brigade by Martin Limón: Synopsis and Online Purchase Options. Synopsis (from the publisher): Seoul, early 1970s: US Army Sergeant George Sueño is on a mission of extreme importance to the South Korean government, as well as the US Army. Kim Il-Sung has vowed to reunite North and South Korea into one country before he hands control of the government over to his son, which means North Korea is planning to cross the DMZ and overpower the American-allied South Korean government. Sueño's mission is to prevent this by sneaking into North Korea and obtaining an ancient map detailing the network of secret tunnels that run underneath the DMZ. To do so, he will have to go undercover and infiltrate the North Korean Communist inner sanctum. Aware of the often dubious nature of the US Military's tactics, Sueño is skeptical about his assignment. But he has other things on his mind. The keeper of the map is Doc Yong, a former lover of Sueño's who was forced to flee South Korea the year before—and she has a son. Before they can be happily reunited, the plan falls to pieces, and Sueño is captured. Can he rely on the enigmatic Hero Kang, his sole contact in the hostile country? Will the lovely Rhee Mi-Sook, the leader of the North Korean secret police, be too much to handle? And who are the mysterious group of women known as the Joy Brigade?